Contest may only be entered in or from Austria, Belgium, the Czech Republic, Denmark, Finland, France, Germany, Greece, Luxembourg, the Netherlands, Norway, Poland, Spain, Sweden, Switzerland and the United Kingdom, and entries originating from any other jurisdiction are not eligible for entry. This Contest is governed by the laws of England and Wales. A 2K “MyPLAYER” account (“2K Account”). 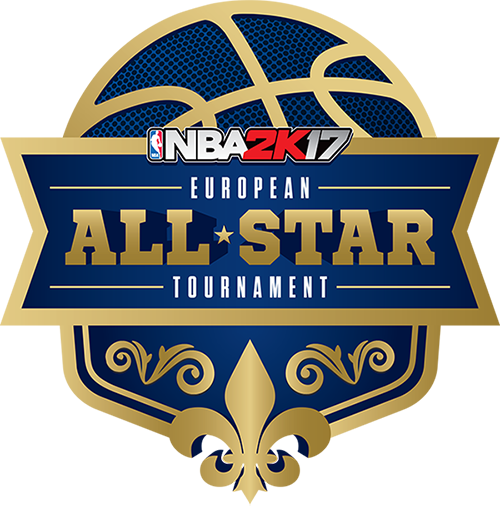 (ii)	Team Owner will need to log on to Team Owner’s 2K Account in NBA 2K17 on the PS4, and create a Pro-Am Team (“Team”) consisting of a total (i.e. including the Team Owner) of a minimum of three (3) and up to a maximum of ten (10) individual team members (each a “Team Member”). (iii)	The Team must achieve Pro Status or higher, prior to a Qualifying GameDay. The Team playing a Qualifying Game must consist of a minimum of three (3) and up to a maximum of five (5) individual Team Members to participate per game (each a “Qualifying Game”). If there are less than five (5) individual Team Members playing, A.I. (computer-generated) players will fill out the remainder of the Team as necessary. To be a Team Member and play for the Team in a Qualifying Game, players must be on the relevant Team’s roster. All participating Teams in any Qualifying GameDay will be matched with one-on-one blind opponents for Qualifying Games. All of the Team’s/Team Owner’s Qualifying Wins will contribute to the Team/Team Owner’s score on the Leaderboard. The Team/Team Owner with the highest score on the Leaderboard at the end of each Qualifying GameDay will be that Qualifying GameDay’s Winner (subject to confirmation) and will be eligible for the Contest Final. Teams/Team Owners may only play as one Team and on one 2K Account and PSN ID per GameDay, but can play multiple Qualifying Games in a Qualifying GameDay as the same Team/Team Owner. Teams/Team Owners suspected of using multiple 2K Accounts and/or PSN IDs to play as multiple Teams in a Qualifying GameDay will be subject to disqualification. While a Team/Team Owner must enlist at least two (2) Team Members to play a Qualifying Game, only the Team/Team Owner will be considered the “entrant” whose Score will be reflected on the Leaderboard and only the Team/Team Owner will be eligible to advance to the Contest Final. While a Team/Team Owner can play with different Team Members throughout a Qualifying GameDay, only the Team/Team Owner’s Qualifying Wins and Leaderboard Score will be considered in the Contest and only the Team/Team Owner will advance to the Contest Final. All aspects of this Contest are subject to these Official Rules. No automated entry devices and/or programs permitted. All entries (including game play) become the sole and exclusive property of the Sponsor and receipt of entries will not be acknowledged or returned. Sponsor is not responsible for lost, late, illegible, stolen, incomplete, invalid, unintelligible, misdirected, technically corrupted or garbled entries, which will be disqualified, or for problems of any kind whether mechanical, human or electronic. Proof of submission will not be deemed to be proof of receipt by Sponsor. By entering the Contest, Teams/Team Owners and Team Members fully and unconditionally agree to be bound by these rules and the decisions of the judges, which will be final and binding in all matters relating to the Contest. Sponsor has the right to use all Team names, logos and uniforms in its advertising, marketing and publicity materials, in its sole and absolute discretion. In addition, Sponsor has the right to require a Team to change its name, logo and/or uniform if such name, logo or uniform is deemed inappropriate or could violate the right of any third party, including, but not limited, to copyright, trademark or right of publicity or privacy, as determined by Sponsor in its sole discretion. 2. Eligibility. Participation open only to legal residents of Austria, Belgium, the Czech Republic, Denmark, Finland, France, Germany, Greece, Luxembourg, the Netherlands, Norway, Poland, Spain, Sweden, Switzerland and the United Kingdom, who are 13 or older as of date of entry. Void where prohibited or restricted by law. Employees, officers and directors of 2K Games, Inc. (“Sponsor”), NBA Properties, Inc., the National Basketball Association and its member teams (collectively “the NBA Entities”), Sony Interactive Entertainment Europe Ltd, Twitch Interactive, Inc., Valve Corporation (collectively, the “Sponsor Parties”) and their respective parent companies, subsidiaries, affiliates, partners, advertising and promotion agencies, manufacturers or distributors of Contest materials and their immediate families (parents, children, siblings, spouse) or members of the same household (whether related or not) of such employees/officers/directors are not eligible to enter. Subject to all applicable federal, state and local laws and regulations. 3. Qualifying Contest Rounds. There will be two (2) Qualifying GameDays, which will take place in accordance with the Contest Schedule below. The first Qualifying GameDay begins on December 10, 2016 at 4:00:00 pm GMT and ends at 12:00:00 am GMT (“First GameDay”) and the second Qualifying GameDay begins on December 11, 2016 at 4:00:00 pm GMT and ends at 12:00:00 am GMT (“Second GameDay”). To advance to the Contest Final, Team/Team Owner must have the highest score on a Qualifying GameDay Leaderboard. CONTEST FINALS: On or about January 11, 2017 (tentative and subject to confirmation), 12 noon – 4 pm GMT, scheduled to take place live in London, England (subject to change by Sponsor in its sole discretion). 4. Leaderboard Score/Qualifying Games/Wins/Ties/Game Play. Leaderboard Score: Teams/Team Owners will receive a score for each Qualifying Win based on a combination of Teammate Grade, Game Statistics, and Game Score. A.I. Team Members will contribute a teammate grade of C. All Qualifying Wins for which play is commenced and completed in accordance with these Official Rules shall count toward Team/Team Owner’s final score on the Leaderboard. Each Team/Team Owner will appear only once on the Leaderboard per Qualifying GameDay, regardless of the number of Qualifying Wins on that day. Qualifying Games/Wins: All Qualifying Games must be played in Pro-Am mode, in 5 minute quarters, on Superstar difficulty and Simulation Game Style. Only games started and completed within the scheduled times on a Qualifying GameDay will qualify as a Qualifying Game. Once a game has started, Team/Team Owners that do not complete the game will be credited with a loss and will be ineligible to play additional Qualifying Games on that Qualifying GameDay. The #1 Ranked Team/Team Owner at the conclusion of each Qualifying GameDay will advance to the Contest Finals (subject to confirmation and compliance with these Rules). (iii)	Highest field goal percentage. Game Play/Disqualification: Teams can be disqualified for that Qualifying GameDay if Sponsor detects that Team/Team Owner and all Team Members did not complete the match by quitting, powering down, disconnecting from the internet, being removed for an F teammate grade or excessive penalties. For clarity, if the Team/Team Owner and all Team Members disconnect, the Team/Team Owner and all Team Members will be disqualified and banned from playing any further Qualifying Games that Qualifying Game Day. A ban would eliminate Team/Team Owner and all Team Members from participating as a Team/Team Owner or a Team Member for any further Qualifying Games on that Qualifying GameDay. In the event that Team/Team Owner and all Team Members disconnect from the server at any point during a Qualifying Game, that Team/Team Owner will be deemed the loser of that Qualifying Game, regardless of whether such disconnection is intentional and/or is the fault of the disconnecting Team/Team Owner and his/her statistics for that Qualifying Game will not count (though the winning Team’s statistics will count for that Qualifying Game) and the disconnecting Team/Team Owner will be ineligible to play additional Qualifying Games on that Qualifying GameDay. 5. Notification/Finalist Team Confirmation: At the conclusion of the 2 Qualifying GameDays, Sponsor will attempt to contact the Teams/Team Owners of the top five (5) Ranked Teams/Team Owners of each Qualifying GameDay, via email using the address provided by Teams/Team Owner when signing up for a 2K Account, through in-game messaging and/or through console UI. Such Teams/Team Owners will be required to respond to Sponsor’s request within three (3) calendar days of notification (unless Sponsor has designated another time frame), and provide Sponsor with a final list of the five (5) Team Members for his or her Finalist Team by December 19, 2016. (unless Sponsor has designated another time frame). Team Owner must be one of the five (5) Team Members in the Finalist Team participating in the Contest Finals. Each Finalist Team must have five (5) Team Members available to compete in the Finals. It is the winning Team/Team Owner’s responsibility to provide Sponsor with the final list of Finalist Team Members within the time frame designated by Sponsor. If the Team/Team Owner does not provide Sponsor with the final list of Finalist Team Members in the time frame designated by Sponsor or does not otherwise comply with these Official Rules, the Team’s/Team Owner’s Contest Finals spot may be forfeited and Sponsor may award the spot to the next highest ranked Team/Team Owner on that GameDay’s Leaderboard (time permitting). If the #1 Ranked Team/Team Owner on the Leaderboard does not respond within the time frame designated by Sponsor or does not comply with these Official Rules, the Team’s/Team Owner’s Contest Final spot may be forfeited and Sponsor may award the spot to next highest ranked Team/Team Owner on that Qualifying GameDay’s Leaderboard (time permitting). Upon verification by Sponsor and compliance with these Official Rules, the #1 Ranked Team/Team Owner on the Leaderboard for that Qualifying GameDay will be officially deemed the winner of that Qualifying GameDay (“GameDay Winner”). A Team can only be a GameDay Winner once. In the event the same Team/Team Owner is the #1 Ranked Team/Team Owner on the Leaderboard for both Qualifying GameDays, such Team/Team Owner will be deemed the GameDay Winner for the First Qualifying GameDay, and the next highest ranked Team/Team Owner from the Second Qualifying GameDay will be the GameDay Winner for the First Qualifying GameDay, provided always that such Team/Team Owner has also responded within the time frame designated by Sponsor and is in compliance with these Official Rules. 6. Contest Finals. The two GameDay Winners (each a “Finalist”) will advance, with their respective Finalist Team’s Team Members (each a “Finalist Team Member”) to the Contest Finals to take place in London, England on or about January 11, 2017 (subject to confirmation and/or change by Sponsor in its sole discretion). The Contest Finals will be conducted in a best of three games, elimination format, with all games to be played in Pro-Am mode, in 5 minute quarters, on Superstar difficulty and Simulation Game Style. The winning Team/Team Owner will be crowned the Contest Champion (subject to confirmation and compliance with these Official Rules). The Contest Finals schedule is subject to change even on the scheduled day. It is each Finalist Team Member's responsibility to ensure that each of Finalist Team Members is contactable at all times prior to the completion of the Contest Final and any return travel to be undertaken in connection with the Contest Final, to be informed of any updates to the Contest Finals’ schedule. ALL POTENTIALLY WINNING FINALIST TEAM MEMBERS MUST BE VERIFIED BY SPONSOR TO ENSURE ELIGIBILITY PRIOR TO BEING DECLARED A WINNER AND/OR RECEIVING ANY PRIZE. Sponsor reserves the right, in its sole and absolute discretion, to conduct background checks on potential Finalists Team Owners and their Finalist Team Members. Failure to comply with such search may result in disqualification of a potential Finalist Team/Team Owner and/or any of their respective Finalist Team Members (as applicable) and may result in selection of an alternate (time permitting) Team/Team Owner. Sponsor also reserves the right, in its sole and absolute discretion, to disqualify a potential Finalist Team Owner and/or Finalist Team Member based on the results of such background check, if the Sponsor determines, in its sole and absolute discretion, that awarding this opportunity to such potential Finalist Team Owner and/or Finalist Team Member might reflect negatively on the Contest, Sponsor, and/or the NBA Entities. Factors that may result in disqualification of a Finalist Team Owner and/or Finalist Team Member, include, without limitation, conviction of a felony or misdemeanor, or any other criminal or civil offense as determined in the sole and absolute discretion of the Sponsor or, if Sponsor determines, in its sole and absolute discretion, that awarding a prize to such individual may reflect unfavorably on the Contest, Sponsor, and/or the NBA Entities. 7. Final Teams: Once a Team/Team Owner is officially deemed to be a GameDay Winner/Finalist, the Team’s roster (including players, player ratings, appearance, attribute boosts, badges and any other distinguishing trait that any Finalist Team Member has applied to his MyPLAYER) and Team branding will be locked for the Contest Finals. If the GameDay Winner’s Team Owner is unavailable for the Contest Finals, the Contest Finals spot may be forfeited and awarded to the next highest ranked Team/Team Owner on that Qualifying GameDay’s Leaderboard (time-permitting). If, after having provided Sponsor with a final list of the five (5) Team Members for his or her Finalist Team, any of such 5 designated Finalist Team Members are not available for the Contest Finals, the Contest Finals spot may be forfeited and awarded to the next highest ranked Team/Team Owner on that Qualifying GameDay’s Leaderboard (time-permitting), as determined by Sponsor in its sole and absolute discretion. Replacement decisions based on forfeitures shall be determined by Sponsor in its sole and absolute discretion. 8. Contest Play. Teams/Team Owners and all respective Team Members must strictly adhere to all game play guidelines and these Official Rules or risk the possibility of disqualification. Teams/Team Owners and all respective Team Members must conduct themselves in a sportsmanlike manner, maintaining a friendly and polite demeanor to competitors and to other participants of the Contest. Teams/Team Owners and all respective Team Members who engage in unsportsmanlike, disruptive, annoying, harassing or threatening conduct or violate any rule, gain unfair advantage in participating in the Contest, or obtain winner status using fraudulent means, in Sponsor’s sole discretion, will be disqualified. Sponsor will interpret these Rules and resolve any disputes, conflicting claims or ambiguities concerning the Rules or the Contest and the Sponsor’s decisions concerning such disputes shall be final. Sponsor may prohibit a Team/Team Owner or any respective Team Member from participating in any stage of the Contest or winning a prize if, in its sole discretion, Sponsor determines that said Team/Team Owner or any respective Team Member is attempting to undermine the legitimate operation of the Contest by cheating, hacking, deception, or other unfair playing practices (including the use of automated quick entry programs) or intending to annoy, abuse, threaten or harass any other players or Sponsor’s representatives. In the event the result of any Qualifying Game is reported incorrectly, whether due to a technical fault in the game or to players tampering with the game software or hardware to manipulate the reported points or score, Sponsor reserves the right to change, in Sponsor’s sole discretion, such incorrectly reported score or points of such Qualifying Game to reflect the correct score and/or to disqualify any Team/Team Owner and/or Team Member who tampers with the game in breach of these Rules. 9. Contest Prizes. The Finalist Team Members of both Finalist Teams (collectively, “Finalist Winners”) will receive a trip to the Contest Finals (“Contest Prize”), which, at a minimum, consists of a three (3) day/three (3) night trip to London, England (subject to change by Sponsor in its sole discretion) to compete in the Contest Finals, and 1 ticket per Finalist Team Member for the NBA Global Games London 2017 game on January 12, 2017 in London. Trip includes round-trip coach airfare from major gateway airport near Finalist Team Members’ respective residences, and single occupancy hotel accommodations (except if the Finalist Team Member is a minor and then double occupancy hotel accommodations, to accommodate the minor’s parent/legal guardian). Finalist Team Members must travel on a date determined by Sponsor in its sole and absolute discretion, which is expected to be during the period on or about between January 9 to January 14, 2017, or on other dates designated by Sponsor, or prize may be forfeited. Failure to appear at the Contest Finals on dates and times designated by Sponsor will result in forfeiture of prize and disqualification from Contest, all as determined by Sponsor in its sole and absolute discretion. In the event of forfeiture, no compensation will be provided. If a Finalist Team Member is considered a minor in his/her jurisdiction of residence, the Finalist Team Member must be accompanied by his or her parent or legal guardian. Finalist Team Members and parent or legal guardian (if a minor) must travel on the same itinerary and both the Finalist Team Members and parent or legal guardian (if a minor) must sign travel/liability/publicity releases prior to ticketing. In order to attend the Contest, Finalist Team Members and parent or legal guardian (if a minor) must agree to sign such releases and to be videotaped, photographed, streamed and/or recorded by Sponsor Parties. Approximate Retail Value of each Finalist Team Member’s Contest Prize: $1,300 (US Dollars), but actual value may vary depending on air flight fluctuations, distance between departure and destination. Finalist Team Members will not receive any difference between actual and approximate retail value of the Contest Prize. Limit of one (1) Contest Prize per person. Sponsor has the right to use all Finalist Team names, logos and uniforms in its advertising, marketing and publicity materials in its sole discretion. In addition, Sponsor has the right to require a Finalist Team to change its name, logo and/or uniform if such name, logo or uniform is deemed inappropriate or could violate the right of any third party, including, but not limited, to copyright, trademark or right of publicity or privacy rights, as determined by Sponsor in its sole discretion. 10. Grand Prize: The Team Members of the Contest Champion Team (each a “Contest Winner”) that wins the Contest Finals in accordance with these Official Rules, as determined by Sponsor in its sole and absolute discretion, will receive a round trip to the 2017 NBA All-Star Weekend in New Orleans, Louisiana. Trip includes round-trip coach airfare from major gateway airport near Contest Winners’ respective residences and single occupancy hotel accommodations (except if Contest Winner is a minor and then double occupancy hotel accommodations, to accommodate the minor’s parent/legal guardian), one (1) ticket per Contest Winner to the 2017 NBA All-Star Weekend events (“Events”) at Smoothie King Center in New Orleans, Louisiana, including All-Star Saturday Night and the NBA All-Star Game (“All-Star Prize”). Contest Winners must travel on a date determined by Sponsor in its sole and absolute discretion, which is expected to be between February 15, 2017 to February 20, 2017, or on other dates designated by Sponsor, or prize may be forfeited. If a Contest Winner is considered a minor in his/her jurisdiction of residence, the Contest Winner must be accompanied by his or her parent or legal guardian. Contest Winners and parent or legal guardian (if a minor) must travel on the same itinerary and both the Contest Winner and parent or legal guardian (if a minor) must sign travel/liability/publicity releases prior to ticketing. In order to attend the Contest and receive the Grand Prize and travel, Contest Winners and parent or legal guardian (if a minor) must agree to sign such releases and to be videotaped, photographed, streamed and/or recorded by Sponsor Parties. Contest Winner and parent or legal guardian (if a minor) may be required to stay additional days in the location of the Contest (accommodation provided by Sponsor) and Contest Winner may be required to participate in certain public relations events, as determined by Sponsor in its sole and absolute discretion, including to participate in an exhibition match against the North American champions. Approximate Total Retail Value of the Grand Prize is $15,500 US, but actual value may vary depending on air flight fluctuations, distance between departure and destination. Contest Winners and Finalist Team Members will be referred to herein each as a “Winner” or collectively as “Winners”. ALL-STAR TICKETS: The terms and conditions of the Event tickets awarded will govern if any of the Events do not take place due to weather, an act of God, threat or act of terrorism, civil disturbance or any other reason. Event tickets are subject to certain terms and conditions. Seat locations will be determined by the Sponsor. The Released Parties (defined below), and/or any other relevant party, reserve the right to remove or to deny entry to any Winner or guest who engages in a disruptive manner, or with intent to annoy, abuse, threaten, or harass any other person at the Events. Cash cannot be substituted for any ticket prize unless otherwise agreed by the Sponsor. Unused tickets cannot be refunded, exchanged for cash or applied towards tickets for any subsequent years. No responsibility is assumed by the Released Parties for any cancelled, rescheduled, delayed or postponed Event. FOR ALL TRIP PRIZES: Taxes, meals, gratuities, travel upgrades, or any other expenses not specifically listed herein are the responsibility of the Winner. Travel and accommodations subject to availability; certain restrictions and blackout dates may apply. Sponsor and the other Released Parties are NOT liable for delays, cancellation or unforeseen events related to the flights. Winners and parent or legal guardian (if a minor) will be solely responsible for obtaining valid identification (e.g., passports) and any other required documentation or requirements (e.g. visas etc.) relating to acceptance and use of the travel prize packages. Winners and parent or legal guardian (if a minor) will be solely responsible for obtaining valid identification relating to acceptance and use of the travel prize packages. If in the judgment of Sponsor, air travel is not required due to a Winner’s proximity to prize location, ground transportation will be substituted for roundtrip air travel at Sponsor’s sole and absolute discretion. Winners will not receive difference between actual and approximate retail value or any prize(s). Sponsor will not replace any lost or stolen prize and/or any lost, mutilated or stolen tickets, travel vouchers or certificates. FOR ALL PRIZES: Approximate Retail Value of all prizes combined: $28,500 US. All Winners will be required to complete and return documents, including an Affidavit/Declaration of Eligibility and Liability/Publicity release and rights transfer document, and appropriate tax forms to receive the prize. If a Winner is considered a minor in his/her jurisdiction of residence, his/her parent or legal guardian will have to execute the required documents. As a condition of awarding a prize, Winner will be required to execute the Affidavit/Declaration of Eligibility and Liability/Publicity and return to Sponsor within the time frame designated by Sponsor. Failure to return such documents in the time frame required by Sponsor may result in forfeiture of prize. Winners are responsible for ensuring return of all required materials; proof of sending will not be considered proof of receipt by Sponsor. If any prize or prize notification messages are returned as undeliverable, or a Winner does not respond in the time frame required by Sponsor, or refuses to execute the required documents, or rejects his/her prize (or any part thereof), or in the event of noncompliance with these Official Rules or Contest requirements, the prize will be forfeited and may be awarded to the next runner-up, as determined by Sponsor in its sole and absolute discretion. In the event of prize forfeiture, no compensation will be given. Prizes are not transferable. No substitutions or exchanges of any prize will be permitted, except that Sponsor reserves the right to substitute a prize of equal or greater value for any prize. Winners acknowledge that the Prize(s) (or any part thereof) may be provided by a third party and that the Winner’s acceptance of the Prize(s) may therefore be subject to such third party’s own terms and conditions. Failure on the part (or any part thereof) of the Winner to accept any such third party’s terms and conditions shall result in the Winner forfeiting the Prize. Any complaints must be directed to the relevant third party provider. All taxes and unspecified expenses, including but not limited to any taxes, insurance, broadband/data charges and/or other costs and/or expenses incurred in connection with any participation in this Contest and/or in connection with the acceptance, use or enjoyment of any Prize(s) are the sole responsibility of the relevant participant. All Prizes and all parts thereof are awarded “AS IS” and WITHOUT WARRANTY OF ANY KIND, express or implied (including, without limitation, any implied warranty of merchantability or fitness for a particular purpose), except where prohibited by law. ALL FEDERAL, STATE, PROVINCIAL AND LOCAL TAXES ASSOCIATED WITH THE PRIZE ARE THE SOLE RESPONSIBILITY OF THE WINNERS AND CANADIAN WINNERS WILL BE REQUIRED TO REPORT AND PAY ANY INCOME TAXES RELATED TO THE PRIZE. 12. General Release. BY PARTICIPATING IN THE CONTEST, ALL PLAYERS (AS WELL AS THEIR PARENT OR LEGAL GUARDIAN IF A MINOR), TEAM OWNERS, TEAM MEMBERS, AND WINNERS RELEASE THE SPONSOR, THE NBA ENTITIES, ALL OTHER SPONSOR PARTIES, AND ANY OF THEIR RESPECTIVE PARENT COMPANIES, SUBSIDIARIES AFFILIATES, DIRECTORS, OFFICERS, EMPLOYEES, SPONSORS, AND AGENTS, INCLUDING ADVERTISING AND PROMOTION AGENCIES (“RELEASED PARTIES”), FROM ANY AND ALL LIABILITY, FOR LOSS, HARM, DAMAGE, INJURY, COST OR EXPENSE WHATSOEVER INCLUDING, WITHOUT LIMITATION, PROPERTY DAMAGE, PERSONAL INJURY AND/OR DEATH WHICH MAY OCCUR IN CONNECTION WITH, PREPARATION FOR, TRAVEL TO, OR PARTICIPATION IN CONTEST OR POSSESSION, ACCEPTANCE AND/OR USE OR MISUSE OF PRIZE OR PARTICIPATION IN ANY CONTEST-RELATED ACTIVITY AND FOR ANY CLAIMS BASED ON PUBLICITY RIGHTS, DEFAMATION, INVASION OF PRIVACY, COPYRIGHT INFRINGEMENT, TRADEMARK INFRINGEMENT OR ANY OTHER INTELLECTUAL PROPERTY-RELATED CAUSE OF ACTION, AND AGREE NOT TO MAKE ANY CLAIMS AGAINST THE RELEASED PARTIES IN RESPECT THEREOF, INCLUDING, WITHOUT LIMITATION (I) ANY CONDITION CAUSED BY EVENTS BEYOND SPONSOR'S CONTROL THAT MAY CAUSE THE CONTEST TO BE DISRUPTED OR CORRUPTED; (II) ANY INJURIES, LOSSES, ILLNESS, LITIGATION OR DAMAGES (COMPENSATORY, DIRECT, INCIDENTAL, CONSEQUENTIAL OR OTHERWISE) OF ANY KIND ARISING OR RESULTING, IN WHOLE OR IN PART, DIRECTLY OR INDIRECTLY, FROM THE AWARDING, DELIVERY, ACCEPTANCE, USE, MISUSE, POSSESSION, LOSS OR MISDIRECTION OF A PRIZE OR PARTICIPATION IN THIS CONTEST OR IN ANY ACTIVITY OR TRAVEL RELATED THERETO OR FROM ANY INTERACTION WITH, OR DOWNLOADING OF, COMPUTER CONTEST INFORMATION; AND (III) ANY PRINTING OR TYPOGRAPHICAL ERRORS IN ANY MATERIALS ASSOCIATED WITH THE CONTEST. Sponsor's decisions in all respects relative to the Contest are final. Each Winner’s acceptance of a prize constitutes the grant of an unconditional right for the Released Parties to use Winner’s name, address (country only), likeness, photograph, biographical and prize information and/or statements about the promotion for any publicity, advertising and promotional purposes without additional compensation, except where prohibited by law, and releases the Released Parties from any liability with respect thereto. 13. General Conditions. By entering the Contest, all players (and their parent/legal guardian if a minor) accept and agree to be bound by these Official Rules and the decisions of the Sponsor. No automated entry devices and/or programs permitted. All entries become the sole and exclusive property of the Sponsor and receipt of entries will not be acknowledged or returned. Proof of submission will not be deemed to be proof of receipt by Sponsor. In case of dispute of the identity of any winner, entries will be declared made by the authorized account holder of the email address provided at time of entry. “Authorized account holder” is defined as the natural person assigned an email address by an Internet access provider, online service provider or other organization responsible for assigning email addresses for the domain associated with the submitted email address. Released Parties are not responsible for technical, hardware, software, telephone or other communications malfunctions, errors or failures of any kind, lost or unavailable network connections, web site, Internet, or ISP availability, unauthorized human intervention, traffic congestion, incomplete or inaccurate capture of entry information (regardless of cause) or failed, incomplete, garbled, jumbled or delayed computer transmissions which may limit one’s ability to enter the Contest, including any injury or damage to player’s or any other person’s computer relating to or resulting from participating in this Contest or downloading any materials in this Contest. Sponsor reserves the right, in its sole discretion, to cancel, terminate, modify, extend or suspend this Contest should (in its sole discretion) virus, bugs, non-authorized human intervention, fraud or other causes beyond its control corrupt or affect the administration, security, fairness or proper conduct of the Contest. In such case, Sponsor may select the winners from all eligible entries received prior to and/or after (if appropriate) the action taken by Sponsor. Sponsor reserves the right, at its sole discretion, to disqualify any individual it finds, in its sole discretion, to be tampering with the entry process or the operation of the Contest or any web sites, platforms or consoles associated with this Contest. Sponsor may prohibit a Team Owner or Team Member from participating in the Contest or winning a prize if, in its sole discretion, it determines that said player is attempting to undermine the legitimate operation of the Contest by cheating, hacking, deception, or other unfair playing practices (including but not limited to the use of automated entry programs, the use of automated entry devices, playing through the use of multiple 2K Sports accounts, or by participating in, or benefiting from, a syndicate, group or block playing process or system), or intending to annoy, abuse, threaten or harass any other players or Sponsor representatives. CAUTION: ANY ATTEMPT BY ANY PERSON TO DELIBERATELY DAMAGE ANY WEB SITES, PLATFORMS OR CONSOLES ASSOCIATED WITH THIS CONTEST OR UNDERMINE THE LEGITIMATE OPERATION OF THE CONTEST MAY BE A VIOLATION OF CRIMINAL AND CIVIL LAWS AND SHOULD SUCH AN ATTEMPT BE MADE, THE SPONSOR RESERVES THE RIGHT TO SEEK DAMAGES FROM ANY SUCH PERSON TO THE FULLEST EXTENT PERMITTED BY LAW. 14. Additional Conditions. Except where prohibited by law, by accepting any prize, Winner consents to the use of his/her name, photo and/or likeness, biographical information, winning entry and statements attributed to winner (if true) for advertising and promotional purposes without additional compensation. 15. Governing Law and Jurisdiction. This promotion is governed by the laws of England and Wales, and is subject to all applicable laws and regulations. Void where prohibited by law. All issues and questions concerning the construction, validity, interpretation and enforceability of these Official Rules, or the rights and obligations of player and Sponsor in connection with this Contest, shall be governed by, and construed in accordance with, the laws of England and Wales, and shall be determined in the courts of England and Wales. 16. Miscellaneous. The invalidity or unenforceability of any provision herein shall not affect in any way the validity and enforceability of any other provision in these Official Rules. 17. Winners List; Rules Request. For a copy of the winners’ list, send a self-addressed, business-size envelope, to be received by Sponsor on or before January 11, 2017, to Sponsor at the address listed below, Attn: The NBA 2K17 Winners List. To obtain a copy of these Official Rules, visit the Site or, by December 5, 2016, send a self-addressed business-size envelope to Sponsor at the address listed below, Attn: NBA 2K17 Rules Request, Saxon House, 2-4 Victoria Street, Windsor, Berkshire SL4 1EN, United Kingdom. Sponsor: Take-Two Interactive Software Europe Limited t/a 2K Sports (“2K”), a wholly owned subsidiary of Take-Two Interactive Software, Inc. The Sponsor’s address is Saxon House, 2-4 Victoria Street, Windsor, Berkshire SL4 1EN, United Kingdom.